The Chinese expression “樂極生悲” (lè jí shēng bēi) literally means “extreme joy begets sorrow.” It first appeared in the Huaji biographies of the Sh? jì (史記), or “Records of the Grand Historian,” by Sima Qian (around 135–86 B.C.)(1). During the Warring States period (475–221 B.C), there was a short period of peace among the states. 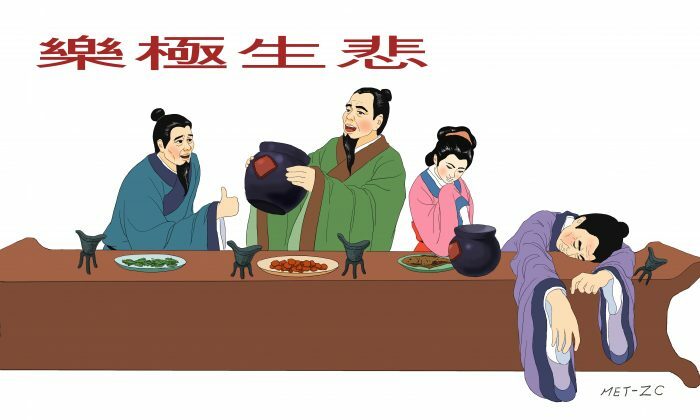 The king of the state of Qi began to indulge in wine and entertainment night after night. The next day, he was often too drunk to take care of state affairs. All the ministers were quite worried but could do very little to convince the king to rid himself of the attachment to wine. The other states saw this as an opportunity to annex the Qi state. In 349 B.C., the state of Chu was the first to attack Qi. The king of Qi was quite shocked and immediately sent the diplomat Chunyu Kun to ask for help from the king of Zhao, a neighboring state. Chunyu was an outstanding politician and diplomat. Although he was short and unhandsome, he was highly respected for his talent and knowledge of the Dao. He set off for Zhao with many valuable gifts. The Zhao king received Chunyu warmly and treated him as an honored guest. Chunyu discussed the situation of the states and shared his view on the advantages of a Zhao alliance with Qi. He persuaded the king of Zhao to send 100,000 soldiers to help the state of Qi. The news spread very quickly. Hearing that the Qi would receive the military support of 100,000 men from Zhao, the king of Chu ordered his army to withdraw. Now, the king of Qi was relieved and very pleased with Chunyu’s success. In order to show his appreciation to Chunyu, the king held a banquet in the palace in his honor. Ministers and other high-ranking officials were invited. Chunyu than answered: “If I drink with your majesty with the ministers around and the guards watching, I would be very afraid that I would be drunk and embarrass myself after only one liter of wine. If I drink with villagers in a harvest celebration, I would feel happy and care-free and would be able to drink 8 liters of wine before getting drunk. Hearing Chunyu’s answer, the ministers nodded their heads and the king realized he was receiving sincere advice. Understanding his folly, the king had nothing more to say. From that moment on, the king stopped drinking and took better care of state affairs. The “Records of the Grand Historian” covers more than 2,000 years of Chinese history, from the Yellow Emperor (2600 B.C.) to the reign of Emperor Wu of Han (87 B.C.) and was written by the great Chinese historian Sima Qian. He is considered the father of Chinese historiography for his work.